A tower is considered competing when it fulfils the same coverage or capacity goals or both as another nearby tower. Because coverage and capacity goals can vary widely depending upon the terrain, population density and distribution, time of day, difficulty of zoning, and proximity of other existing sites, there is no uniform distance where a tower would be considered as competing with another tower. We regularly assist our tower company clients with evaluating prospective acquisitions to determine how many competing towers are present across the portfolio of target towers. A tower is considered competing if it falls within the same search area or search ring as another tower. 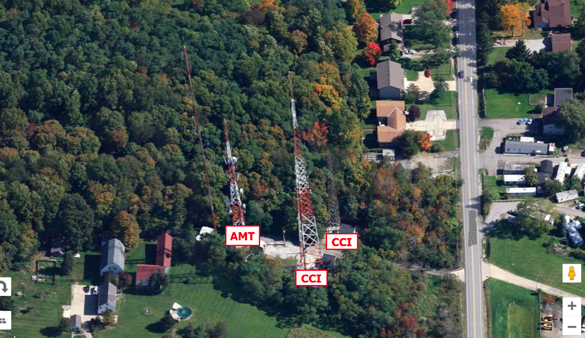 It’s not hard to see that the AMT and CCI towers in the photo above are competitive. However, when looking at large numbers of towers, it isn’t feasible to look at each set of towers and we must make assumptions. As a rule of thumb, we tend to use the following distances for urban, suburban, and rural areas- ¼, ½, and 1 mile. In other words, if a tower is located within ¼ mile of another tower in an urban area, it could compete for the same prospective tenant. Of course, there are situations where that distance could be less or greater. For ease of analysis though, we utilize these distances. For example, we previously completed an analysis of our proprietary tower data for a large hedge fund. Specifically, we examined each of the public tower companies’ tower datasets and compared to our own tower data. We looked separately at each large public tower company’s exposure to competitive towers in urban, suburban, and rural areas based upon multiple radii. We chose to use urban/suburban/rural designations instead of BTAs. While BTAs are used by the public tower companies as a proxy for urban/suburban/rural, we find that is misleading as BTAs can include urban and suburban and sometimes rural sub-areas in the same BTA. We also examined each public tower company portfolio individually so that we could see which company was better positioned for rural expansion, urban infill and densification, and suburban expansion and densification. We also looked to see on average how many competing towers each tower company’s urban, suburban and rural towers had within a distance where a wireless carrier could choose one or the other tower. 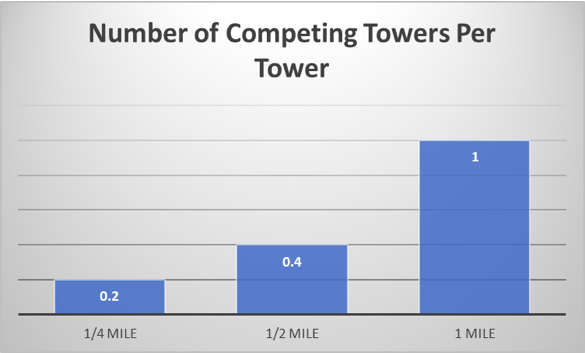 We found that on average the public tower companies have .2 competing towers for each of their towers within ¼ mile, .4 competing towers within ½ mile, and just over 1 competing tower within 1 mile on a nationwide basis. Please note that this doesn’t directly contradict Morgan Stanley’s findings as our methodology looks at average number of competing towers per tower while theirs appears to look at the number of towers with any competing towers within a given distance. Interestingly, the public tower companies have different levels of exposure to competing towers depending upon whether their towers are in urban/suburban/rural areas with some tower companies having more exposure in rural areas and less in urban areas and vice versa. When you examine how each tower company acquired or built their towers, this stands to reason. SBA chose to acquire towers from other tower companies while Crown Castle and American Tower acquired large chunks of their portfolios from wireless carriers and tower companies. The tower companies have differing exposure to competing towers depending upon where and how they acquired their towers. Another point of interest is that there are more competing towers within the assumed “competitive” radii than there were 10 years ago across urban, suburban, and rural towers although this is more pronounced in urban areas as should be expected. We examined the number of competing towers in 2007, 2011, and 2017, and found that the number of competing towers had increased between 25% and 50% between 2007 and 2017. This despite more difficult zoning regulations in many areas that would prevent new towers near existing towers. Our next near-term project will be using this previous analysis to evaluate how many new towers have been proposed or built near existing tower company towers to date- not just by Tillman but by other build-to-relocate (or BTR) developers as well. If you recall from previous articles, some wireless carriers have simply told any tower company that would listen where they would like to move off an existing tower, with the first tower company to have a tower standing being the one they would lease from. If you are interested in discussing or purchasing any of our findings, please contact us. A client of ours owns more than a few cell towers that have AT&T as a collocation tenant. They recently received this letter, yet another in a long line of letters that threaten the tower owner with some dire consequence if they don't renegotiate or sell their tower to AT&T. In this case, the threat is somewhat comical. "The sale of your tower to certain parties may result in AT&T sending a non-renewal notice regarding our lease." How is that a threat? If a tower owner has already sold the tower to a third party, why would they care whether AT&T sends a non-renewal notice? Perhaps AT&T's thought is that if the seller needs to get an estoppel from AT&T regarding its lease to present to the buyer, that AT&T's can thwart the sale of the tower by instead sending a notice of non-renewal? In our experience, most buyers don't really care whether a notice of non-renewal is sent, provided that there is enough term remaining before they can choose not to renew or if the tower is located in an area with zoning regulations that prohibit construction of new towers near existing towers. The other comical part is that AT&T (through its' financial supplier) is asking for lease information about each tower so that the financial supplier can process the information and make an offer. Of course, AT&T then also has information about other subleases that the tower owner has on your tower which can be used against the tower owner in future lease negotiations. If you are inclined to sell your tower, reach out to us and we can give you a free back of the napkin estimate of the value of the tower. We won't use your information against you and we won't threaten you with sending laughable notice's of non-renewal in order to get you to sell. If you aren't interested in selling but feel like you need some help in addressing these threats from AT&T, please call us to discuss your situation further. 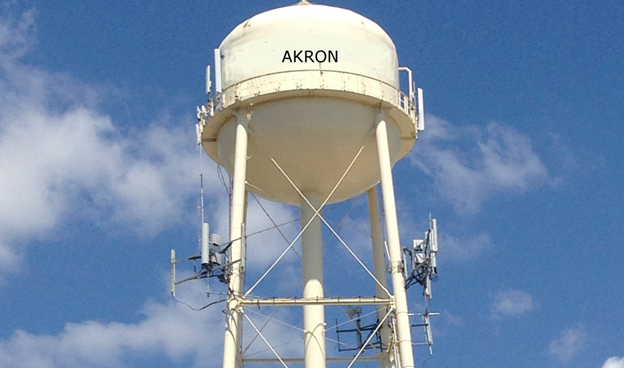 The City of Akron has decided to sell its cell tower and water tower leases to Everest Infrastructure Partners. Curious who they are? The founders are previously from Tristar Investors- a company that purchased easements under tower company towers in order to sell them back to the tower companies. I can’t say whether Everest has the same business model. What is interesting though is that Everest paid a pretty penny for these assets. Typically, we advise cities against selling their leases because the sale limits the ability of future city councils to use the underlying properties as they see fit. For example, in this case, the City of Akron won’t be able to tear down these water towers at the end of their life or redevelop the underlying properties where the towers sit. That may not be an issue in this case depending upon the location and age of the properties/water towers. We also advise against selling of leases because the buyout offers for the leases aren’t nearly as high as what Everest Infrastructure Partners paid here. With this type of multiple of cashflow, this transaction is more like that of a tower acquisition than a traditional lease buyout. That’s because Everest gets the current and future revenue from these structures and properties that were sold and the City gets none. Of course, there are many cases where cities like Akron don’t have another immediately accessible source of funding that doesn’t require raising taxes and must turn to liquidating assets like these cell tower leases. Here the City of Akron was facing a significant cash crunch. We have worked with two other Ohio cities that also ended up selling their leases. In both cases, they evaluated whether the location of the tower or water tower would potentially impact future expansion or development plans. After evaluating the potential sale, they determined that they could live with the future obligations. Another point of interest is that the lease buyout market is getting frothy- we are seeing more entrants and higher offers than at any time in the last few years. For example, we just received a call from a company that had shut its doors and has now found funding to buy leases again. If you are considering selling your lease, it may make sense to look at doing it now. If you need to know more about lease buyouts- we have a very handy and complete website about the subject- www.celltowerleasebuyout.com. Give us a call and we can help you ascertain the market value of your lease and walk you through the options related to selling. Cell Tower Info was created in 2005 and has recently been updated with a new skin, new features and more information for clients and cell tower landlords. If you’re interested in the cell tower leasing process – from acquisition to deployment and leasing, please take a look! While we had heard about this previously, the news was not public until yesterday. Reuters is reporting that MacQuarie has put Global Tower Partners up for sale. Global Tower Partners owns 6,400 towers and manages or leases another 9,600 properties across the US. Some of these properties are not active cell site locations, they are just large property owners who signed up with Global Tower Partners to market their sites. Others are active cell sites, but ones where Global Tower Partners only owns the rights to the ground lease, not the towers.